"Are you down with OCP? Detroit's finest zombie robot cop is back, he's 18-inches tall, and he's got a lot to say! 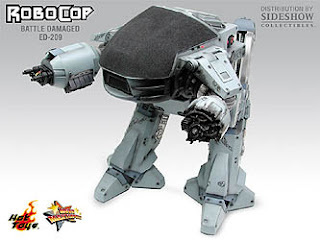 Expertly crafted with numerous details rarely seen on a Robocop figure of any size, this great big figure is sure to be a fine addition to your home, office, or criminally infested toy room." "Thank you for your cooperation" and "Your move, creep!" "Serve the public trust, protect the innocent, uphold the law." "Dead or alive, you''re coming with me." "Come quielty or there will be... trouble." 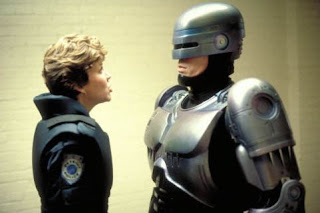 "Clarence Boddicker, you are under arrest." "
"Eliminate all scumbags and creeps. 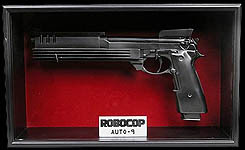 The famous revolver from Robocop can now be yours! Measuring 14-inches long and made of resin, this prop replica comes mounted in a shadow box. Limited edition of 1,000 pieces. Use it to eliminate all scumbags and creeps, or just show off to your friends." "McFarlane's Pop Culture Masterworks brings an entirely new dimension to Robocop's original one-sheet movie poster. Combining traditional sculpture with forced perspective, the iconic image comes to life, and the results are as dazzling as the film that inspired it." 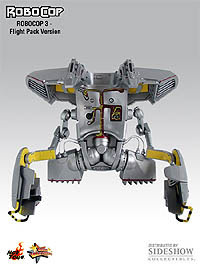 The Battle Damaged ED-209 Model Kit from Robocop is part of Hot Toys Movie Masterpiece Series. This 15 inch figure was previously released as a Japanese exclusive, and this hard to find collectible is now available for pre-order from Sideshow as a Limited Edition. 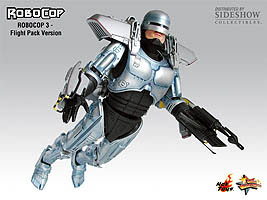 Features include: movie accurate and highly detailed, fully painted, multiple points of articulation, and is in scale with the Robocop with Flight Pack Model Kit. 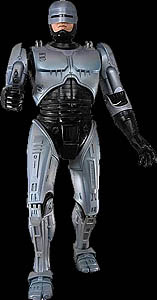 From Hot Toys Movie Masterpiece Series comes the extremely Limited Edition Robocop with Flight Pack Model Kit. The 12-inch figure is highly detailed, movie authentic and is fully articulated. Features include: working thigh holster, pistol, several interchangeable hands, arm cannon, flight pack with over 14 points of articulation, and figure stand with Robocop logo. 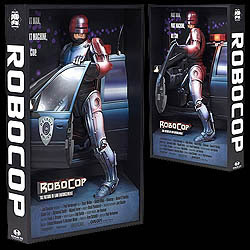 This is a hot item that many Robocop fans will want and will not last long.